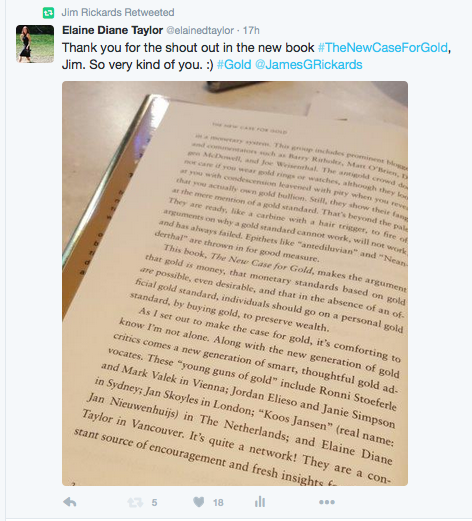 Synopsis of Jim Rickards, New York Times bestselling author of The New Case for Gold, The Death of Money, Currency Wars and The Road to Ruin, with Alex Stanczyk from The Gold Chronicles November 2018 podcast. The USMCA trade agreement is what NAFTA was intended to be, but President Trump was able to get a better deal for the US. For example, more jobs for US workers by creating inputs in the US with assembly then done in Mexico. Prime Minister Trudeau didn’t want tariffs on Canadian cars sold in the US because it would have killed their car industry, and Trump used that leverage to get Canada to sign the deal. There’s still some unfinished business with items like solar panels and dairy. The USMCA (or CAMUS as Canada calls it) is not new wine in old bottles. It’s not the NAFTA agreement with a different name. Trump’s trade advisor, Robert Lighthizer, is a very seasoned and smart negotiator. He advised President Ronald Reagan back when Japan’s car sales were hurting Detroit. By threatening to put a tariff on the then popular Japanese autos, Lighthizer had Reagan influence Japan to build their cars in the US to avoid the tariff. Japanese cars have done well in the US, and the US got hundreds of thousands of good paying jobs with benefits. Lighthizer is advising President Trump as he negotiates with President Xi of China, using this same playbook . Today it’s iPhones, electronics and a lot of manufactured good affected by this trade issue. The China story is important but it’s being over-reported. What’s more intriguing is what’s not happening at the G20 as opposed to what’s happening. President Trump is not meeting with the Crown Prince of Saudi Arabia, and he’s not meeting with Putin because of a military confrontation with the Ukraine. The Ukraine has declared martial law on themselves, and they’ve prohibited Russian men between 16 and 60 from entering the Ukraine. It’s ridiculous because if Russia wants to enter the Ukraine it will. The Ukraine is doing these things for show. The real question is whether or not the Ukrainian navy can stand up to the Russian navy. Russia doesn’t have any natural boundaries between it and a potential invasion. There’s the Ural Mountains, but all the important stuff in Russia is west of the mountains, which means it’s just a big plain from the Netherlands all the way to Moscow. Napoleon proved it and Hitler proved it. If you roll over the land you might have your hands full when you get to Moscow, but there’s nothing stopping an invasion. What Russia’s always done is to have buffer states: Poland, the Ukraine, Romania, Georgia, Estonia, Latvia, Lithuania. If you wanted to get to Russia you had to go around those states first. But most of that buffer has been lost. The fall of the Berlin Wall in 1989 and the breakup of the Soviet Union in 1991 left them in chaos for about ten years. Meanwhile, the US and NATO contributed to the liberation of a lot of those buffer nations, along, of course, with the bravery of the nations’ people. Those states broke away from Russia, but two areas are ambiguous or uncertain: the Ukraine and Georgia. In 2007, Russia invaded Georgia and took the northern half of it. And now there’s a mess in the Ukraine. The Ukraine had a functioning democracy and had elected a pro-Putin president, where prior to that they had more western leaders. They were leaning to the West but had a leader who was closer to Putin. Both sides were kind of happy and they probably should have left it that way. But the US and UK got involved in one of the Ukraine’s revolutions in 2014, (see the song Wag the Dog), and chased the leader out of town. He’s now in exile in Moscow while there’s now a more western leader in place. Putin wasn’t happy because he’d finally had a friendly guy in there and the western nations deposed him. From there Putin destabilized eastern Ukraine and then took Crimea. The US threw on sanctions and it’s been escalating since. Trump would probably love to meet with Putin to talk about important topics – arms treaties and sanctions, and perhaps about working together when it comes to China. But there’s an angle with the Mueller Russian investigation, and with Michael Cohen, Trump’s former lawyer, talking about Trump’s associates potentially talking about a Russian hotel development. It’s been clouding the issue for two years. The problem with the people in Washington is that they’re so political 24/7 that they have no experience in the real world with business. They don’t know what it’s like to negotiate a hotel or skyscraper and to try to finance it. You ingratiate yourself with the leaders of the countries as part of the process of getting the building deal done. This recent incident in the Ukraine could lead to Russia escalating and taking more territory. Russia dominates the world of natural gas. They control 60 – 70% or more of the natural gas going into western Europe. If Russia turns off the tap then a lot of Europe would be freezing in the dark. Those pipelines run through the Ukraine, so the Ukrainians have some leverage because they can shut down or divert the gas. But if they did then Russia could escalate things and roll right in and turn the gas back on. Trump can’t even get a conversation in with Putin. By hitting Russia so hard with financial sanctions, travel bans and seizing assets, the US has already thrown everything they can at Russia, short of an act of war. So if Russia escalates things in the Ukraine what is the US going to do? Kick them out of SWIFT dollar payment system? That’s a good way to start World War III. That’s not going to happen. So if Trump could negotiate with Putin they might be able to work something out, but Trump’s opposers are keeping that from happening. Meanwhile, Russia is buying 30 – 40 tonnes of gold every month. Between 2014 and 2017 Russia’s reserves went down from $500 billion to $300 billion, partly because of falling oil prices. It put stress on their economy, but they sold US dollar assets and didn’t sell any of their gold. At that time instead they kept buying physical gold. Their reserves are now back over $400 billion, partly because oil is back over the low price back then. And the Russians are still buying more gold. The Chinese are also buying gold. The difference is that China is sneaky about it while Russia is very transparent. The Russian Central Bank website updates monthly and shows their gold purchases. Putin openly says they’re getting out from under the US dollar payment system. Russia creates a cryptocurrency. Not Bitcoin, but their own Russian cryptocurrency – a Putincoin. And China does the same thing, creating their own Xicoin. They link up together with a private distributed ledger on a network that is segregated and separate from the main internet. Together they create a coin that acts as a stable coin that is pegged to the International Monetary Fund’s ‘Special Drawing Rights’ (SDR). This is used as a stable benchmark. They are de facto pegged to the US dollar price of gold. From there they invite others to join in this stable coin system, such as Turkey, Iran and North Korea. Brazil and South Africa have also expressed interest in joining. In this scenario they have a private internet with a distributed ledger using a Putin coin or a Xi coin, trading with a stable coin that’s pegged to the SDR. The stable coin would fluctuate against the euro and the dollar, just as the euro and the dollar fluctuate against the SDR. And then the nations start trading. Each nation buys and sells with the other nations denominated in the new coins, which are pegged to the SDR. So their trading is valued in the SDR, but their medium of exchange is a private coin on a private network. Then they keep tabs just like countries usually do with trade – they run a surplus or a deficit with each other. Then either monthly, quarterly or yearly they settle up with physical gold. Nothing involves the US dollar. This is what’s being created. They could fly the gold from nation to nation to settle up, or else have it all vaulted in Switzerland and just move it from one nation’s account to the other. This system is efficient and it’s already being worked on. Back in January when the trade war started, Jim said that it would not be resolved quickly and will escalate and affect world trade. The market has begun to wake up to that fact. This is more than just a trade war. This is a currency war and a trade war at the same time. China is using the currency war to fight the trade war. China devalued the yuan almost 20% in about seven months. So with a 25% tariff, the price of the goods ends up about the same, but the loss is to the worker whose yuan is worth less. Vice President Mike Pence said recently that it’s not just a currency war or a trade war – it’s the struggle for supremecy in the 21st century. Pence says the US is not going to let China dominate 5G technology. They’re not going to let China buy US companies. Some critics have described it as a new cold war and that’s not far from the case. This is why the trade war isn’t going to be over quickly. It’s part of a bigger conflict that’s far from over. The Fed is out to raise interest rates four times a year, by 25 basis points each time, each March, June, October and December like clockwork. They plan to do this until they get to 3.5 – 4% inflation and maybe higher. They want to get interest rates high enough so that when the next recession comes they can cut them enough to get out of the recession. If we had a recession today the Fed would cut rates by 2.25% down to zero and then find themselves in the same position that Ben Bernanke found himself in 2008. They don’t want to have to do QE. Nothing has to do with a “neutral rate” that some are talking about. There’s widespread disagreement on what a neutral rate would even be. There is too much complexity in the system for a neutral rate to mean anything. The Fed won’t stop raising when they reach a so called neutral rate. But they’ll pause raising rates if there’s a severe stock market crash, job losses or extreme disinflation. Gold is at $1,236.40 U.S. per ounce. From Kitco News. The torch and guitar are out. The gold flakes and nuggets are cleaned, shining and gorgeous. The jewelry is made by my hand. Pure gold from the rivers of the Gold Rush Trail in Canada. Boro silicate glass and love. I care about the gold, ethically sourced from artisanal miners, fair paid, all unrefined and beautiful. I care about the symbolism and science of gold. The circumpunct. The sun. Where all energy comes from. The solar system. New tech. Medicine and healing. Space travel. Enduring value. Precious. Beautiful. The boxes and packaging are becoming a work of art in themselves. All by hand. So fun. Creating beauty and value. New songwriting, with scales and lyrics, research and all the quiet behind-the-scenes work that goes inside before the material creation. Lives move in cycles so don’t be concerned if yours is in a quiet stage. Don’t be concerned if it seems like a long time. Time is not as solid as you may think. Gold has been quiet now for a long time. The swing of the pendulum is real in small things and grand things. That’s why we talk about preparing for the fall, the winter, and the brilliant spring that follows. See the bankers wave their Wall Street wands and conjure piles of paper green. Naked short selling is like betting that your neighbour’s house will burn down. But in this scenario the building happens to burn down. If the bankers win then we lose the whole world as we know it. I wrote this in 2009, with a lyric “A little grease (Greece) is floating out to sea, and little pigs (Portugal, Italy, Greece and Spain) are bobbing up and down, they’ll send a storm and we’ll see, when the tide goes out who’s naked on the beach“, and it’s coming on now. The world is changing as we know it.